Protect your vehicle's double axle rear tires from weather damage. 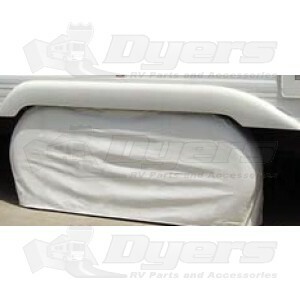 Heavy duty vinyl cover with elasticized bottom hem will block UV rays from deteriorating sidewalls. Prevents premature cracking which can lead to on-road blowouts. Save installation time by covering both tires at once. From out of the box to installed on the camper was less than 5 minutes. Simple and easy,and a perfect fit. Would recommend without reservation. Fantastic price and quality. Very easy to install, fit exactly as advertised.